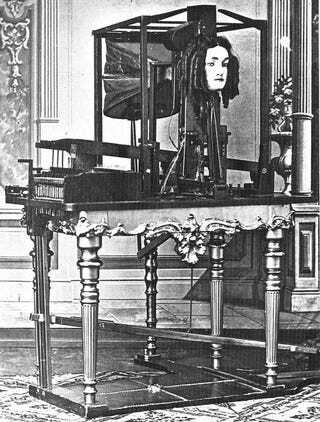 Euphonia was a bizarre sight to behold: a machine bearing a disembodied woman's head attached to bellows that reportedly spoke with a "sepulchral" voice. But it was also the most advanced talking machine of its day, one that may have links to the invention of the telephone. 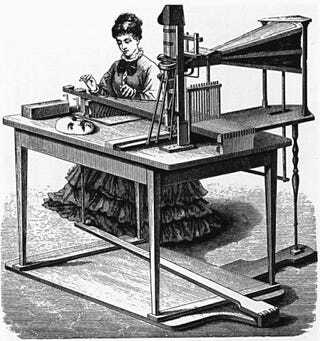 Euphonia was constructed by Joseph Faber, a German immigrant to the United States, and was exhibited in the Musical Fund Hall in Philadelphia in 1845. Faber's admirers, including Joseph Henry, whose electromagnetic relay was the basis for the telegraph (and who was an early supporter of Alexander Graham Bell), indicate that Faber greatly advanced the technology of the talking machine, machines designed to speak with human voices. Euphonia employed 16 keys that provided the elementary sounds for words found in European languages (through movements of the jaws, lips, tongue, and vocal cords) and a 17th key that worked Euphonia's mechanical glottis. It was said that Euphonia's voice was a ghostly monotone, but it could, with a skilled operator, speak in several languages and even sing "God Save the Queen." Henry was deeply impressed by the ingenious device, and even imagined that it might inform a sort of audio telegraph machine, perhaps one that could broadcast sermons over the wire. Euphonia ended up more of a curiosity, however; Faber followed P.T. Barnum to London, where Euphonia was displayed in the Egyptian Hall. Faber, however, was not much of a showman, famously disheveled next to his impressive machine. Euphonia didn't attract nearly the audience that Barnum's more famous promotions did, despite its reported sophistication. It did have at least one more rather significant fan, though: phonetics researcher Alexander Melville Bell, father of Alexander Graham Bell.